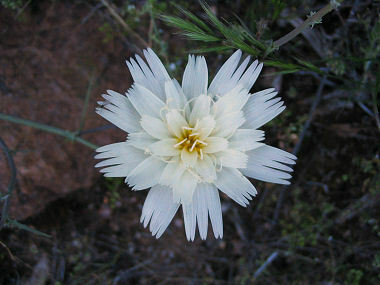 Desert Chicory is a member of the sunflower family. The plant grows at low elevations up to 3000 feet in the desert and on mesas. They attain a height of about 20 inches and have dark green, lobed leaves which are about 6 inches in length. In the spring, the chicory blooms, producing a distinctive white flower which is about 1 ½ inches in diameter. The Desert Chicory has a weak stem and usually relies on the support of surrounding plants to help hold it erect.